The ticket system must be reachable by other services without manual intervention by an agent. OTRS supports this requirement by the Generic Interface. It empowers the administrator to create a web service for a specific task without scripting language knowledge. 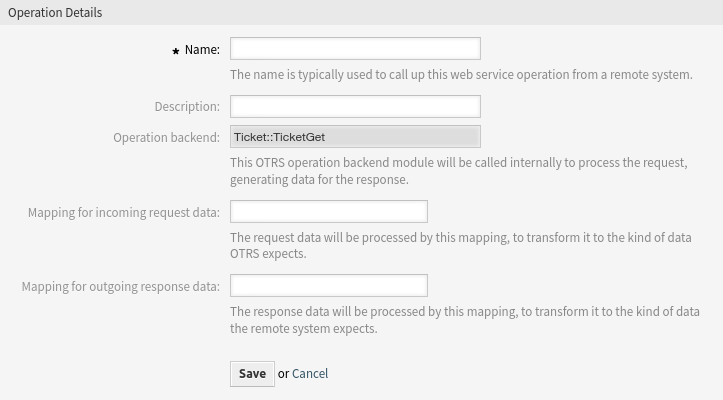 OTRS reacts on incoming REST or SOAP requests and create objects or provides object data to other systems transparently. 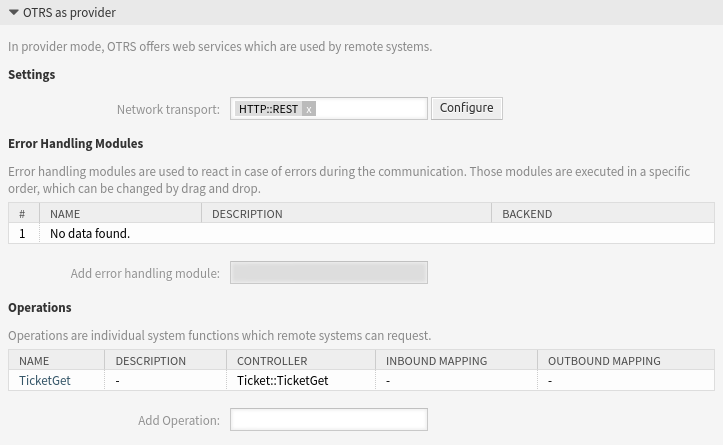 A web service is a communication method between two systems, in our case OTRS and a remote system. In its configuration, the operation or invoker determine the direction of communication, and the mapping and transport take care of how the data is received and interpreted. In its configuration it can be defined what actions the web service can perform internally (operation), what actions the OTRS request can perform remote system (invokers), how data is converted from one system to the other (mapping), and over which protocol the communication will take place (transport). The generic interface is the framework that makes it possible to create web services for OTRS in a predefined way, using already made building blocks that are independent from each other and interchangeable. Use this screen to manage web services in the system. A fresh OTRS installation contains no web service by default. The web service management screen is available in the Web Services module of the Processes & Automation group. Click on the Add Web Service button in the left sidebar. Click on a web service in the list of web services. Click on the Delete Web Service button in the left sidebar. Click on the Delete button in the confirmation dialog. Click on the Clone Web Service button in the left sidebar. Enter a new name for the web service. Click on the Export Web Service button in the left sidebar. Choose a location in your computer to save the Export_ACL.yml file. All stored passwords in the web service configuration will be exported in plain text format. Click on the Configuration History button in the left sidebar. Click on the Debugger button in the left sidebar. Click on the Import Web Service button in the left sidebar. Click on the Browse… button in the dialog. Add a name for the imported web service (optional). Otherwise the name will be taken from the configuration file name. Like comment, but longer text can be added here. The default value is Debug. 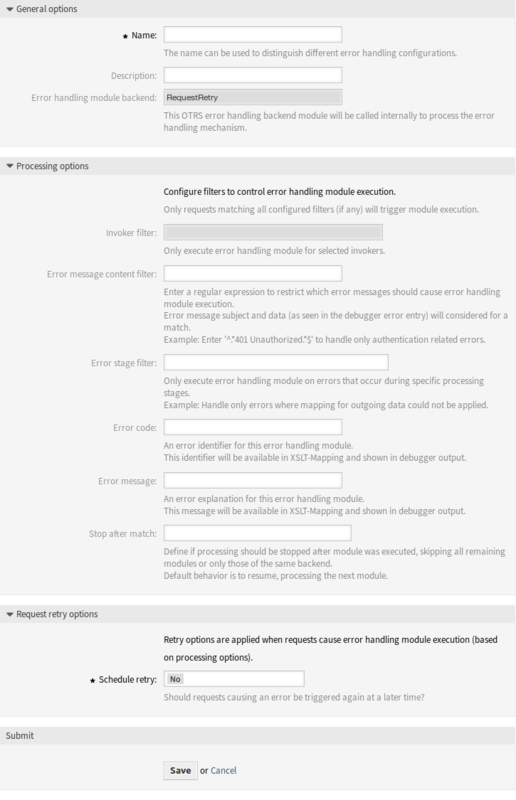 When configured in this manner all communication logs are registered in the database. Each subsequent debug threshold value is more restrictive and discards communication logs of lower order than the one set in the system. 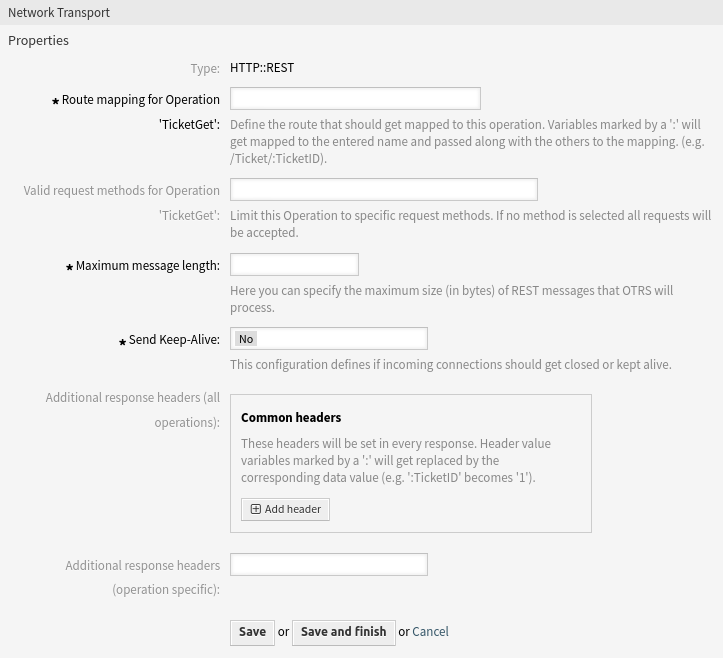 Select which network transport would you like to use with the web service. Possible values are HTTP::REST and HTTP::SOAP. After selecting the transport method, you have to save the configuration with clicking on the Save button. A Configuration button will be displayed next to this field. The Configuration button is visible only, after a network transport was selected and saved. 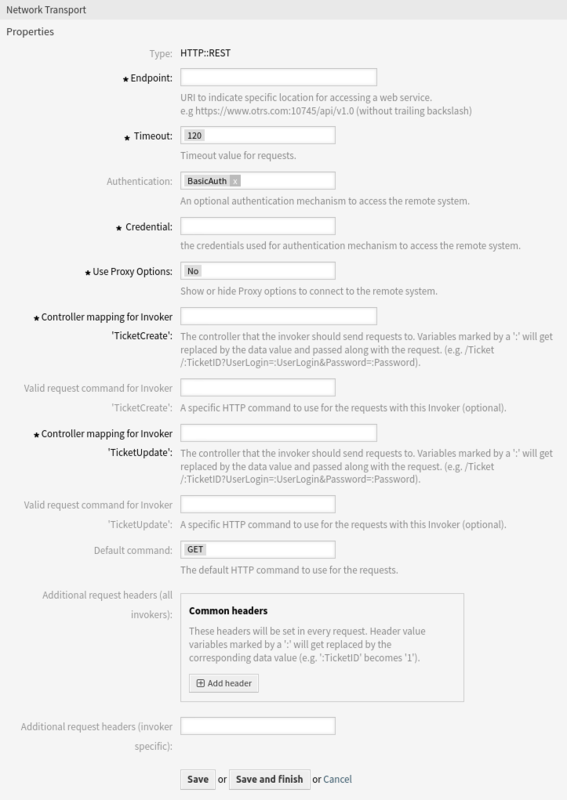 See the configuration for OTRS as Provider - HTTP::REST and OTRS as Provider - HTTP::SOAP below. This option is visible only, after a network transport was selected and saved. Selecting an operation will open a new screen for its configuration. 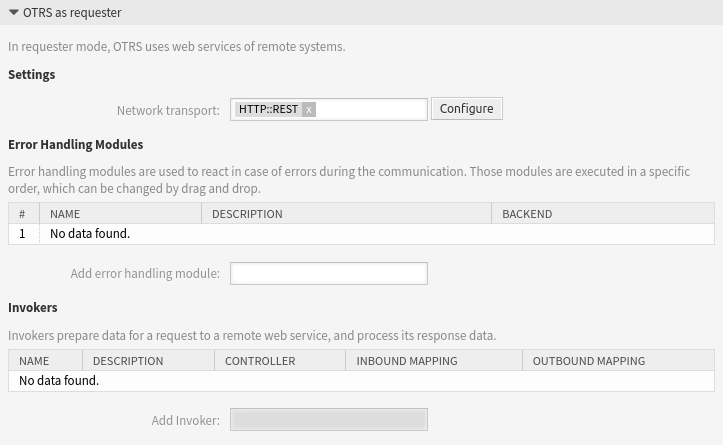 The Configuration button is visible only, after a network transport was selected and saved. 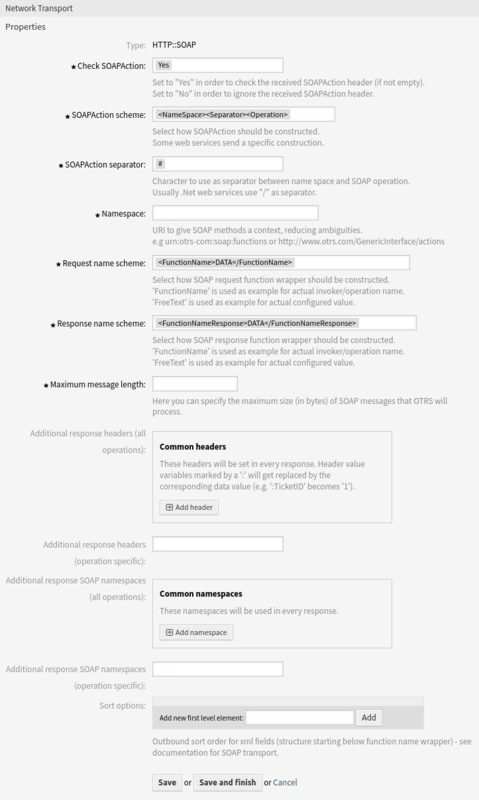 See the configuration for OTRS as Requester - HTTP::REST and OTRS as Requester - HTTP::SOAP below.